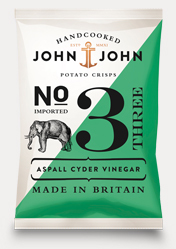 As with many oil stiffened Crisps, these featured a premium Crunch that lasted from the initial bites through to mush stage. They did not crash and the weight of a munch but they were sufficiently thinly cut to avoid splinters and rigidity among the bites. There was a fairly traditional look and feel to these Crisps. They say they are made in England, but they are a German company. They even featured a familiar mainland European greasy, almost transparent appearance on a backdrop of pale yellow. There was a lot of grease left on fingers after a bag plunge. A Nose Plunge Test revealed little. There may have been a background of Vinegar but it was feint, as sadly, was the flavour. These Crisps featured the wonderful warm background of well cooked Potato, but the Vinegar was barely noticeable.